To the beginning boatbuilder, using chisels and block planes is a bit mysterious. Keeping them sharp can feel like black magic. This page is about how I sharpen my chisels and planes so that they are useful. I don't make a fetish out of it. Using a freshly sharpened block plane that just glides on, making a perfect shaving, is one of the great pleasures of woodworking. 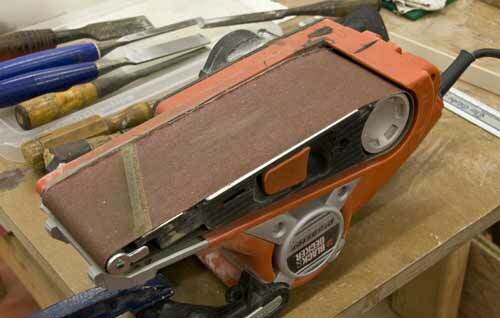 Saws and sandpaper can do a lot to shape your wood but there are times when a sharp blade is faster and better. For example, the easiest way of cutting scarfs to join plywood in order to make longer than 8 feet pieces is by piling up the plywood and cutting an angle with a plane. It is an easy fast set up and is the best method I have used. When making a bird nest mast, using a plane to taper the pieces so that the mast tapers is the easiest way. After gluing up the mast or spar, a plane is a very fast way of rounding the mast. It only needs a quick sand after this. Once you've worked with planes and chisels you will find them really useful. What equipment do you need to sharpen? You need a little gizmo called a honing guide, to clamp your blade and keep your angle consistent. Many people claim they can do it by hand but if you can do that you don't need me to tell you how to sharpen. There are several on the market and some can be quite expensive. Mine came from Home Depot and cost about 10 dollars. It has a Stanley brand stamped on. It has worked ok but is very slightly crooked so all my blades have a very slight angle instead of being perfectly square. It can hold a chisel or a plane blade. You will also need some kind of abrasive. This can be sharpening stones, loose silicon carbide grit or sandpaper/emery cloth. I know people also use bench grinders with specialized open texture wheel, and also belt sanders can be used. I'm not experienced using these so I won't talk about them. For many years I used sandpaper to sharpen and have found that it is a practical and effective way of keeping my tools sharp. All you need are a few sheets of black sandpaper in diminishing grit size. You will also need a flat surface to work on. I have a piece of quarter inch glass slightly larger than the sandpaper. It is very economical and easy to set up. I also keep some spray adhesive but find that I don't usually need to stick the paper down very much. Because the sandpaper wears out quickly you always need new sheets so I think in the long run a couple of stones would be more economical. I keep 80 grit, 150, 320, 400, 600, 1000, and a very fine one that is used by jewellers. I think it is 4000. If you can't find this last one don't worry. You can get very sharp using only up to 600. I started using sandpaper and had every intention of getting "proper" stones. It worked so well I just never got around to it. I've recently been given some stones and they work just fine. I now use a combination of stone and paper. I also have cerium oxide powder, which I used in other polishing projects. I think chromium oxide works well and is sold for this purpose. Jeweller's Rouge is not good because it is too soft for steel. This is for the final polishing. Not an absolutely necessary step and you can skip this if you want. If you have sharpening stones or prefer them, then there are many different kinds to choose from. You will need a coarse and fine one. Depending on the type of stone this may be all you need. Some stones require a third medium grit as well. There is a great deal to learn about stones and a great deal of argument about each. Water stones vs. oil stones, natural vs. man-made vs. reconstituted; Japanese vs Arkensas. If you are a beginner you can get an acceptable result from a combination stone. They are sold as a double sided stone. One side is black and the other orangey. I would also use a fine sandpaper such as 600 to improve the edge. Norton 614636855653 IB8 1-by-2-by-8-Inch Fine/Coarse India Combination Bench stone Larger is easier to use and stays flat longer before needing to be flattened. My combination stone is used with oil. When I use it I put some mineral oil on the stone before I sharpen and it keeps the stone from getting all clogged up. Some stones are made to be used with water. Some of the less expensive combination stones are too coarse to use for chisels and planes. One side should be quite fine and the other coarser. 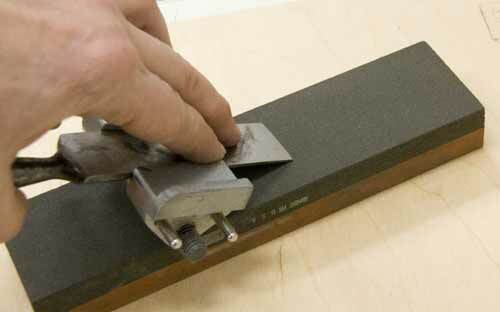 If you already have a coarser stone don't worry and finish sharpening with a finer sandpaper. If you buy too cheap a stone you might have to spend some time flattening it. They are sometimes warped or not perfectly flat. The first step you have to do is to flatten and polish the back of your blade. If the back is pitted or rusty or not perfectly flat you will never get a proper edge. You only have to do this once. 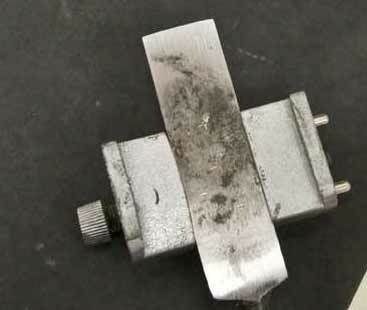 Even new blades are not necessarily flat and often have grinding marks that remain. They also sometimes have a varnish or finish to keep the blade from tarnishing. Using a fine stone or 400 sandpaper lightly polish the back for a few minutes. Look at the back and if the back has been ground evenly everywhere you are fine. If the grinding has been uneven then you will need to flatten the back until it is very flat using coarse to fine steps. If you have inherited old nasty rusty chisels as I have, then you will need to spend some time to get the back in good shape. If you need to, use a coarse stone or sandpaper then use finer grits until the back is very smooth and shiny. Sometimes I think this is the hardest part of the whole process. I used my belt sander to flatten the back of the really pitted blades. If you do this don't let the chisel heat up or you will damage the temper of the steel. I clamped it on the workbench and slowly brought the chisel to the belt. There is a flat spot with a metal platen under the belt. It works well but can heat up. This is a belt designed to grind wood. It's what I had. When it wears out I'll replace it with a metal grinding belt. This belt is a somewhat used 80 grit. I will have to switch to a finer belt, but already the backs are shiny. Clamp your blade in the guide. Here the guide is upside down with a chisel clamped in. I have traced its position on a piece of plywood. This will allow me to easily duplicate this angle when I need to sharpen it again. I have glued a little block of wood at the tip of the traced chisel. It is more accurate. I don't have to look. I just push the chisel against the wood and tighten the guide. Much easier. 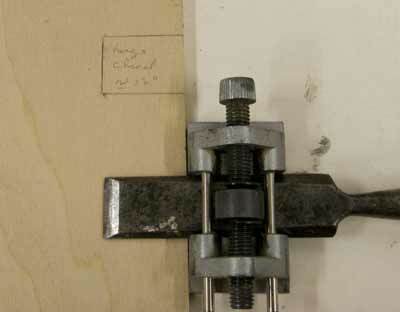 You want to clamp the blade so that the angle that is made between the blade and the stone or sandpaper, is somewhere between 25 and 30 degrees. There is a great deal of advice on the "proper" angle. It's a compromise between weakening your blade by putting too small an angle and not cutting as well with a larger angle. I used about 27 degrees on this chisel. Notice that I traced the position on the plywood so I can easily re position the blade in the holder. To figure out the angle, I use a small protractor and hold it up against the blade/holder until the angle is right. Hock Tools article on sharpening talks about angles. Here is a link to their sharpening page. The angle detail is down the page. All you need to do is slide the chisel against the stone or the sandpaper. Don't stay in the same spot otherwise you will wear a hollow in the stone. The sandpaper will gradually stop cutting and will feel less aggressive. If it is too worn use a new sheet. The little guide will keep the blade at the right angle, just push it evenly back and forth. I use both hands. Once the angle is cut on the blade switch to a finer grit. It can be quite fast depending on the kind of steel on the blade. Don't press too hard, just enough to grind the blade. Be careful not to rock the blade because it will not grind evenly. After you have used the finer abrasives turn the chisel over and grind the back just enough to get rid of the burr. You just need to do a few strokes for this. When I use sandpaper I used many different grits and ended up with the 600 for a quick sharpen or went on to the really fine grades and stropping for a deluxe edge. At this point you have a usable tool. It is not ultra sharp but it will cut easily and cleanly. If you want you can continue and add a small bevel. Many woodworkers add a small bevel by shortening the position of the chisel slightly in the honing tool and grinding a small angle at the very tip. This small angle is only in the last sixteenth of an inch or so of the tip. This has the advantage of making it easier to resharpen when it gets dull since only the very tip has to be resharpened. It is much faster to do a sixteenth of an inch than the quarter inch of the whole bevel. Use a fine grit to do the small bevel if you do it. At this point you have a sharpened chisel. If you want you can continue and use a stropping compound to put an even finer finish on the edge. There are many different materials you can use. Chromium oxide is available and works well. I have a felt wheel I used when I cut stones as a hobby and I use this with cerium oxide. If you don't have a felt wheel you can use paper or flat wood, or a piece of vegetable tanned leather and put the compound on this and pull your chisel against it. You might have seen a barber use an old fashioned leather strop. This is what you are doing. Once you have gone through the whole process you will have a sharp blade. When it gets dull it is simply a matter of either sharpening the little bevel or regrinding the whole bevel with your fine stone or fine sandpaper till it is sharp again. You don't have to use the coarse grades every time and you don't have to touch the back again unless it has rusted or is damaged. Sharpening is not particularly difficult to do but there is a knack to it and you will get it quickly with practice. What I'm describing here will get you started and if you are careful you can get a useful edge to your tools. A quick visit to woodworking supply shops will quickly convince you that there is a great deal more to sharpening than this page shows. Sharpening stones run the range from a few dollars to thousands. Here is a stone that a beginner can use before deciding on a pricier model. Or not... That's about the quality I use, along with sandpaper and it works well enough if you are not a perfection buff. Workshop Companion has a few pages on sharpening tools. Lee Valley has all the sharpening supplies you can dream of... and more. Here are a couple of books on sharpening. 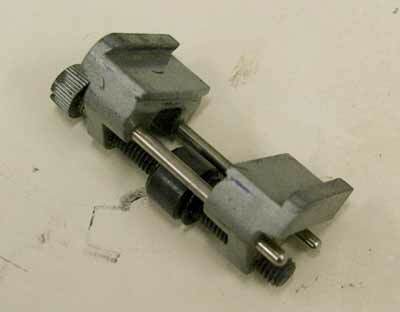 I have calipers such as these and use them all the time. Not essential, but a really nice gadget. Tool Strop article on sharpening. Paul Sellers article Good stuff about angles. Popular Woodworking Magazine article on sharpening a chisel including fixing a chisel that is corroded and pitted. Lie-Nelsen sharpening kit Luxury for tool lovers. I don't claim to be an expert in anything. If you want to build a boat do your homework first. Sharpening anything means you will be handling hopefully very sharp blades, be careful.